Verizon workers helped the company make $39 billion in profits over the last three years—and $1.8 billion a month in profits over the first three months of 2016. But that’s not enough for Verizon. The company’s greed knows no bounds. While the company continues to demand working people give back more and more, Verizon CEO Lowell McAdam made $18 million last year. That’s more than 200 times the compensation of the average Verizon employee! 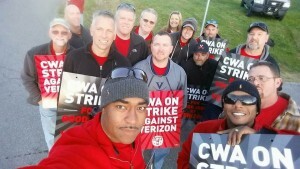 These Verizon workers have been working with an expired union contract since August 2015. The Southern Workers’ School, a project of the Southern Workers Assembly in session tonight April 12, 2016 composed of workplace union activists from 8 Southern states pledges its solidarity and support to the 40,000 sisters and brothers about to go on strike for a just contract against Verizon organized by the Communication Workers of America (CWA) and the International Brotherhood of Electrical Workers (IBEW) unions from Virginia through Pennsylvania. WE reaffirm the absolute necessity for collective bargaining rights enforced by the right to strike for Verizon workers and for all workers regardless of employment status. WE affirm the necessity for Verizon to continue and improve employee benefits and wages particularly in these times of rising income inequality and working class insecurity. WE point out that continual downward pressures by corporations on working class wages and benefits is not only bad for working people and our families but also for our communities and our world. WE will take support action in the southern states where the strike will take place and where the member organizations involved in the Southern Workers’ School exist. 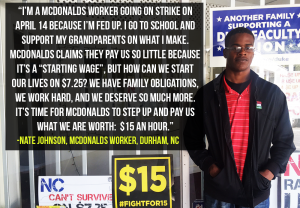 Join FIGHT FOR $15 Strike and Rallies across the South, Country and World on April 14! Join and find a picket line near you! !